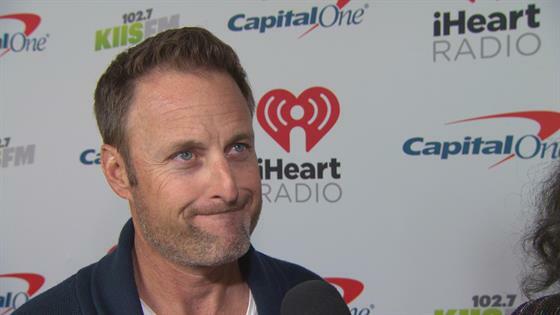 Chris Harrison Calls Colton Underwood's Season of The Bachelor "Gut-Wrenching"
Chris Harrison Talks About Possibility of a Black "Bachelor"
There's dramatic, and then there's Chris Harrison-level of dramatic. If the first promo of Colton Underwood's season of The Bachelor, which premieres Jan. 7, 2019, Underwood jumps over a fence at one point, but of course we have no clue why yet. Plus, there are tears galore and lots of shirtless shots of the former football player. Is it January 7 yet? Harrison, who has been at the helm of Bachelor Nation for years now, talked to E! News' Nina Parker at KIIS FM's iHeartRadio Jingle Ball presented by Capital One about this upcoming season and why people need to give Underwood a chance. "Once you get to see him and know him, everyone is going to fall in love with him and really respect that he is so open, so vulnerable, so emotional," The Bachelor host said. At what point does "so open, so vulnerable, so emotional" become too much? In Bachelor Nation, that could mean many a tear shed. Harrison gave a bit of a snippet as to what we're going to get with Underwood this season. "It's a pretty gut-wrenching, wild ride with him." Ladies and gentlemen, fasten your seat belts. Another Chris Harrison-ism is how he depicts the 26-year-old Underwood's journey to find true love. "Is it the most dramatic? I don't even really need to pump this season up that much because of what you're about to see," Harrison said. "I'm excited for everyone to get to see him for who he really is—the man." After Underwood was named to be the next Bachelor, many people instantly drew connections to a fellow Bachelorette alum who went on to find his wife via roses: Sean Lowe. He has been one of the few successful Bachelor men and was relatively quiet during Emily Maynard's season and stole hearts when he became the one looking for love. "Everyone thought they kind of knew Sean but didn't really get to know him until his season. That's the way it is for Colton," Harrison told E! News. "Colton opens up and I think people are going to be blown away." Harrison also discussed a topic that is often broached within Bachelor Nation among loyal fans and commentators. Will there ever be a black Bachelor? Rachel Lindsay was the first black Bachelorette, and while people were happy there was some racial diversity, some were disappointed when the network went with Underwood instead of a person of color. The host told E! News, "Sure, absolutely. There's no reason not to" have a black Bachelor. But Harrison and the rest of the team want to make sure whoever becomes the next Bachelor or Bachlelorette is a good fit. "Rachel was the right woman. She's extraordinary, smart, beautiful, charismatic, funny. She's an amazing woman," Harrison said. "That's what I want. Same thing for a man. I just want it to be a great man."